Bullet Connector Info: I really like the better hold of the tin plated types. They really give a good solid connection. They are compatible with existing brass bullets. Note there are three sizes on this Page. The most common size is the 4 mm bullets. Some Hondas and maybe others use the smaller 3.5 mm bullets. Some Kawasakis use the smallest 2.5mm size bullets at the bottom of this page. The size is the diameter of the male bullet. Fit wires from 2 - 3 sqmm (14 - 12 AWG). With snug fitting plastic sheaths. Fit wires from .75 - 2 sqmm (18 - 14 AWG). 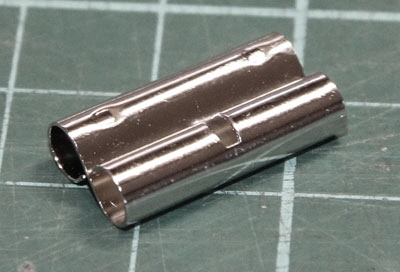 4 mm Nickel Plated Brass Double Female Bullet Connector by Hero. With snug fitting plastic sheath. NOTE: These have the best hold of any double bullets I’ve tried. 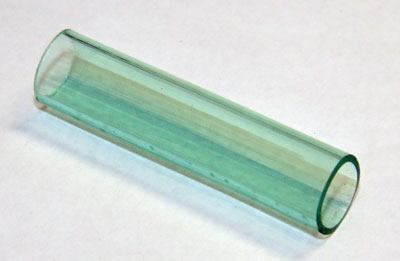 See below for a plastic sheath. NOTE: Crimp to a wire .75 - 2 sqmm (18 - 14 AWG). Plug in up to three 4mm male bullets. These are compatible with all 3.96mm bullets and lock the bullets tightly in place. NOTE: These are compatible with all 3.96mm bullets and lock the bullets tightly in place. Fits both 3 and 4 way bullet connectors above. Snug fitting, tough plastic sheath. 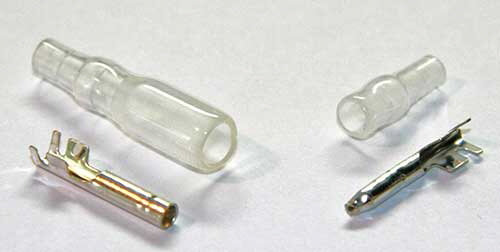 NOTE: These can be used with other types of connectors. 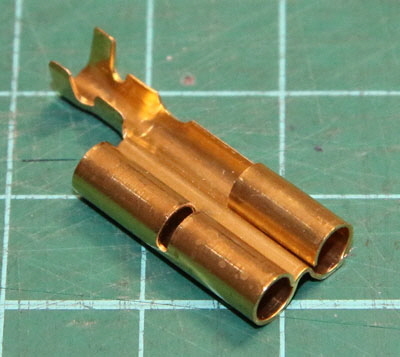 3.5 mm Tin Plated Brass Bullet Connector Sets made by JST. Fit wires from .5 - 2 sqmm (20 - 14 AWG). For a Crimper for bullet connectors see my Tools Page.